Synopsis: The first of Margery Perham's travel journals, taking in her journeys to Samoa and Australia. 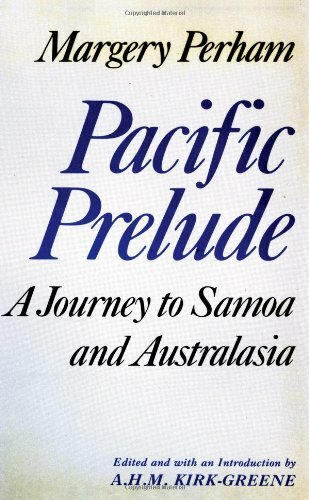 Pacific Prelude will be of special interest to students of interracial relations and colonial government. About the Author&colon; Anthony Kirk-Greene is Emeritus Fellow at St. Antony's College, Oxford. Perham, Dame Margery and Kirk-Greene, A.H.M. 6. PACIFIC PRELUDE. A Journey to Samoa and Australasia, 1929. Edited and with an Introduction by A.H.M. Kirk-Green.